But our staff immediately united strongly in favor of coleslaw defense, for the following reasons. 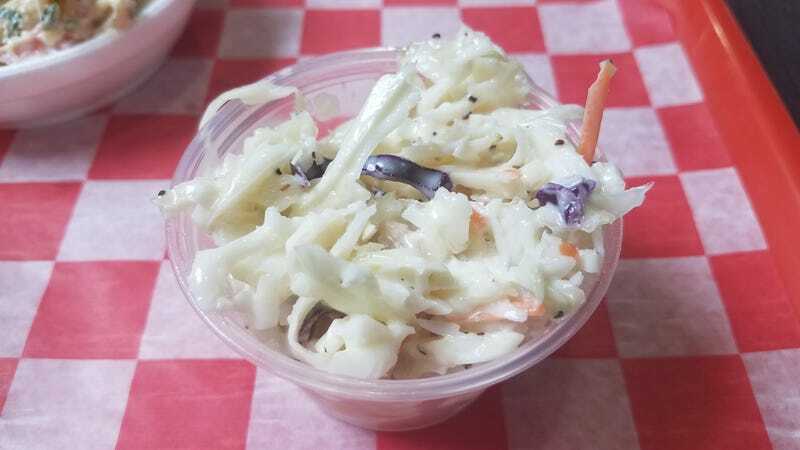 Personally, I am not a huge coleslaw fan; if I spot a big bowl at a picnic or a potluck I’m not completely psyched or anything. But if I get one of those little plastic cups of coleslaw on my plate next to a sloppy joe or pulled pork sandwich, I am automatically delighted. A sandwich is my preferred coleslaw vehicle, as the creamy mayo, crunch, and tangy, saucy flavor all add up to lunch heaven. Just pile it up there right on the bun. Others of us, like Kate Bernot, enjoy the coleslaw just as-is, as sort of palate cleanser. If you’re having some greasy brats or some barbecue-sauce-soaked pulled pork, take a break from all that heaviness with a mouthful or two of coleslaw. The cool creaminess and cabbage crunch will automatically lighten your meal—and it’s probably the only green thing on your plate, right? Except for that pickle. Yes, this is a controversial opinion, and some coleslaws don’t involve mayonnaise but instead Miracle Whip, or even just vinegar. But we will never kick a delicious mayonnaise-based salad off of our lunch plate, ranking coleslaw rightly alongside other favorites like potato, tuna, and egg salad. The ubiquity of coleslaw means you should just give up. You’re as likely to spy it at your neighborhood block party as you are as a side at that authentic barbecue place. Maybe those people are onto something. But if you really don’t like it on its own, try what I suggested above: Just add it to your burger or sandwich. If you still can’t discern the considerable positive attributes of coleslaw after that, you are just not a coleslaw person, and we promise never to bug you about it again.